In the past, bears inhabited the whole European continent, with the exception of the islands of Sardinia, Corsica, Ireland and Iceland. Around the 18th century, however, there was a sharp decline in the presence of bears due to the colonisation of mountainous regions in the form of animal farming, agriculture and deforestation. Human persecution also played a part in this dramatic depopulation, whether for reasons of fear, or the growth of hunting. In the area of present-day Slovenia, at the start of the 20th century, there were only about forty bears remaining. To combat this steady disappearance, various measures were gradually introduced. Some of these measures originated in the Balkans. For example, in 1935 Slovenia declared bears a protected species, in 1953 the hunting period became regulated, and in 1962 the use of poisoned bait was banned. These policies met with some success: now there are about 4000 bears on the Dinaric Alps and the Pindos mountains, which stretch from Slovenia to Greece. This estimate is for 2012-2016, and comes from a study produced for the European Parliament in 2018 by the Norwegian Institute for Nature Research. In the Italian Alps, the first efforts at repopulation were made in Trentino - in 1960 and 1969 around the Val Genova, and in 1974 near Selva Piana, by the Sporeggio valley. Unfortunately, these efforts failed: in the 90s there remained only 3-4 individual bears around the Brenta group, in Trentino. 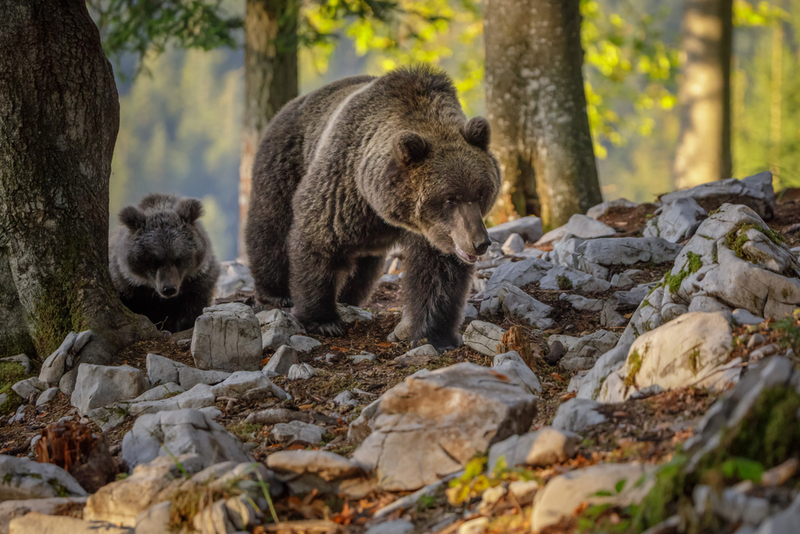 In 1996 a new effort was made at repopulating the region, supported by EU funding from the Life Ursus project: between 1999 and 2002, 10 bears of Slovenian origin were introduced. This time the effort was successful. This is confirmed by Claudio Groff, coordinator of Trentino’s large carnivore service: “The bear population in the central Alps, around Trentino, is relatively small and isolated, and currently amounts to 52-53 specimens; then there are the bears in the border area between Friuli, Carinzia and the Slovenian Alps, which number about 10”. While significant when compared to the past, this represents only a tiny proportion of the entire bear population of Europe: it is estimated that between 15,000 and 16,000 bears inhabit the European Union. The reintroduction of bears has necessitated some regulation of their relationship with humans. The two main legal references are the Berne Convention on the Conservation of European Wildlife and Natural Habitats (1982) and the 92/43/CEE “Habitats” Directive. The Berne Convention classes bears as a “strictly protected” species, while the “Habitats” directive places bears among the species of “community importance”. For such species, special zones of conservation must be created, and careful protection guaranteed. Nevertheless, these obligations are rather generic. For this reason, between 2006 and 2008 the European Commission developed guidelines for managing large carnivores in Europe. In particular, the goal was to clarify the concept of “favourable conservation status”. According to the “Habitats” directive, this status exists when the species “is maintaining itself on a long-term basis as a viable component of its natural habitats; the natural range of the species is neither being reduced nor is likely to be reduced for the foreseeable future; there is, and will probably continue to be, a sufficiently large habitat to maintain its populations on a long-term basis”. Despite these regulatory efforts, according to the authors of the latest report commissioned by the European Parliament, there is still no agreement in Europe over how to interpret “favourable conservation status”, and the measures recommended by the Berne Convention. Among other animals, these uncertainties hinders the protection of brown bears. When we speak of bears, a common subject is the damage, perceived or real, that they cause to animal farming and agriculture. This is a sensitive subject, and often exploited. For example, according to an investigation by the Birn network, in the last 5 years Macedonia has paid over 3 million euro for damages claimed by farmers. Nevertheless, the sudden increase in claims, compared to the past, suggests that there are people trying to profit from legal proceedings even when the damages aren’t caused by bears. In Slovenia, according to the Environment Agency, compensation payments amounted to 590,793 euro between 2005 and 2008. In 17 years, Trentino has paid 1.27 million euro in compensation, according to data provided by Trento’s ex-councillor for agriculture, tourism and hunting. Currently, European countries are searching for solutions to curb the damage caused by bears. Among the solutions proposed are, for example, the introduction of electric fences, and the promotion of grazing, and thus the presence of shepherds and dogs. These methods increase costs, but, according to the experts, they are preferable to compensation payments, and also increase the social acceptance bears on the mountains. The potentially confrontational relationship between people and bears remains the central problem for bears’ continued existence in the Alps. “If tolerance declines below a certain point, this species could disappear due to poaching,” explains Claudio Groff. “It’s clear that if there are bears, there are also incidents, and consequences, and fear: if people decide that these are manageable risks, the bears will remain, otherwise not.” In reality, confrontations between people and bears are rather sporadic. This is why, in the regions where bears have been reintroduced, the local population is often inclined towards tolerance. Across Europe there are different systems for managing the presence of bears. “Europe can be divided into two blocks: the “western”, including Trentino, Abruzzo, the Pyrenees and Asturia. Here the bear populations are small and isolated, and management is geared towards conservation – thus, compensation and prevention of damages, monitoring, all activities aiming to conserve the animal. Only in extreme circumstances are bears shot - if there’s real danger,” explains Groff. The other block includes all of Eastern Europe and Scandinavia. Here the form of management is hunting, and hunting bears is real business. Where hunting is permitted, bears are more accepted for two reasons: first, these are countries with large, sparsely inhabited regions, which allow much easier monitoring of the animals; secondly, bears have never completely disappeared from these regions, so the populations are not afraid. They’ve come to be seen as a tourist attraction”. “For us, unfortunately, the tourism aspect is yet to materialise, and so the bear is only seen as a nuisance,” continues Groff. “For us, where the number of bears is small, shooting even just one bear causes big problems, because it will affect the species’ reproductive capacity. Killing should therefore only be used as a last resort”.